That’s right, is time for another episode of NRRF B Radio, broadcast live (87.9FM) from the mighty Experimental Sound Studio in Chicago, and streamed from Wavefarm radio/Transmission Arts in New York state. Wednesday, April 16, 2014. 11:00-14:00 Central Daylight Savings Time (GMT -5), listen in on WGXC New York on Thursday, April 17, 2014, 0:05-2:20. The Frosty and Frothy NRRF Pirates have found themselves and their trusty schooner locked on a course DUE SOUTH owing to a badly malfunctioning compass. As they approach what appears to be the frozen, southern polar landmass, they suddenly discover that their ship is no longer moving. They are immobilized by the pack ice, so they decide to sing songs while quickly finishing off the rum. In their stupor, the crew encounters one very smelly and dreadfully lost Ijiraq which causes them to vacate the boat and immediately become lost on the ice where they experience many strange sensations and illusions: an unsettling shift in gravity, rings around the sun, a very convincing fata morgana, and several frightening aural hallucinations, all of which confuse them further. As they press forward to nowhere, the ice or permafrost begins to give way under their feet in a glorious thaw. Is the land melting away? Eventually the crew finds magnificent caverns filled with crystalline formations that seem to be connected to a giant electric ray transmitter. What is this strange world? A mirage? Madness? A secret military installation? Or the solution to the world’s fossil fuel addiction? The fearless crew are all frozen in static, and we wonder, what could possibly happen next?!? NRRF is a collaborative effort to make unlicensed neighborhood radio art. B Radio mashes b-list film and pulp fiction genres with radio art to structure the improvisational nature of the shows. It’s live radio, streamed, with special guests and live audience. The core group consists of Jonny Farrow, Anna Friz, Steve Germana, Jeff Kolar, and Peter Speer. Yup, it’s time to sally forth for our fifth and final episode of NRRF B Radio this summer, kindly hosted by the Experimental Sound Studio here in Chicago, with streaming support and rebroadcast from our favourite station WGXC and Wave Farm (free103point9) Transmission Arts in Green and Columbia counties, New York state. This week, NRRF goes underground and returns with BROOD II: Emergence. Year 17 has arrived, and genus Magicicada are crawling out of the ground and playing the largest noise show of all time. But there may be more than one kind of insect emerging from its pupa…. All things insectoid, especially those that come in clouds and swarms. TUNE IN! WEDNESDAY JULY 31, 18h-21h CDST (GMT -6). If you find yourself on Chicago’s north side, tune in to 87.9FM, or better yet, drop in and say hi at ESS, 5925 N Ravenswood, where the live radio is happening. or listen online at http://free103point9.org. free103point9/ WGXC in Greene/Columbia counties NY will rebroadcast the show following the live show at 11CDT. B Radio: a series of radio shows mashing b-list genres with radio art. Each B Radio episode features a theme to structure the improvisational nature of the shows, though tangents are frequent and encouraged. It’s live radio, streamed, with special guests and live audience. The core group of performers play live instruments and electronics, sample wildly, speculate broadly, and have been known to sing. 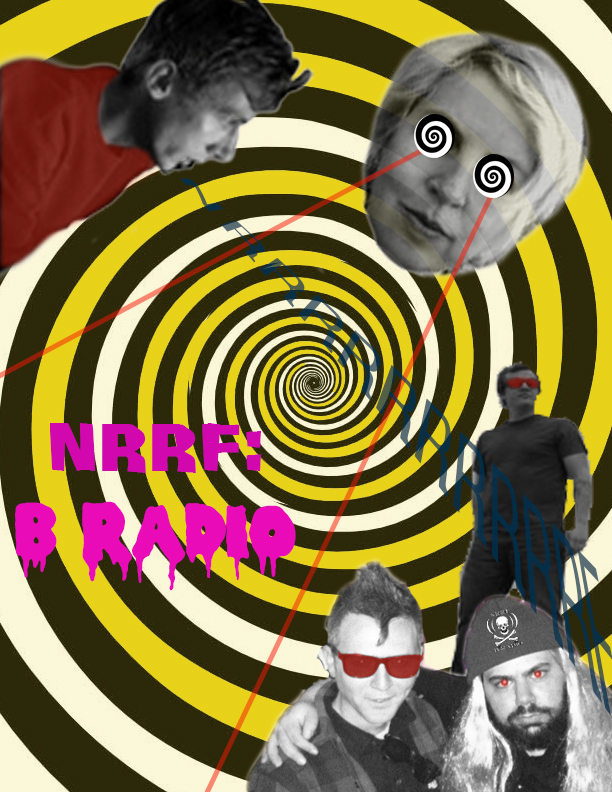 NRRF is a collaborative effort to make unlicensed neighborhood radio art. For this Chicago iteration, the core group of noisemakers consists of Jonny Farrow, Anna Friz, Steve Germana, Jeff Kolar, Peter Speer, with Sarah Knudtson (documentation and props wrangling). Earlier projects include street radio in Montreal (2001), the NRRF Radio Roadshow (2004), and Radio Free Parkdale in Toronto (2005-2007). Pirates away, roll and go! If you are in Chicago, come on down, up, or over to Experimental Sound Studio (ESS) where you will encounter at least five very soggy pirates having a picnic in the Bermuda Triangle. There will be costumes, custom cocktails, and very large knives! Sea shanties! Sentient squid! The innocent Devil’s Triangle! It’s B Radio, episode 4: Pirate Picnic in the Bermuda Triangle! 1. If you are within a several block radius of ESS, tune in to 87.9FM starting at 6pm CDT ending at 9pm. 2. Come to think of it, if you are within a several block radius of ESS, just come over and “watch” radio being made. B Radio: a series of radio shows mashing b-list genres with radio art. Each B Radio episode features a theme to structure the improvisational nature of the shows, though tangents are frequent and encouraged. It’s live radio, streamed, with special guests and live audience. The core group of performers play live instruments and electronics, sample wildly, speculate broadly, and have been known to sing. NRRF is a collaborative effort to make unlicensed neighborhood radio art. For this Chicago iteration, the core group of noisemakers consists of Jonny Farrow, Anna Friz, Steve Germana, Jeff Kolar, Peter Speer, with Sarah Knudtson (documentation and props wrangling). Earlier projects include street radio in Montreal (2001), the NRRF Radio Roadshow (2004), and Radio Free Parkdale in Toronto (2005-2007). Five jolly NRRF pirates set out to sea in their sloop to ride the radio waves. They quickly encounter a massive storm which diverts them into the Bermuda Triangle, where the ship is scuttled and underwater adventures abound, complete with creatures massive and minute, friendly and menacing. Finally they wash up on a remote island, and have to fend for themselves. This radio event might even include a cooking demonstration. Vegan option available. After a harrowing encounter with the Nebulaic Alliance, at which point they may or may not have been cloned, our intrepid NRRF cosmonauts leave the solar system to land upon a mysterious distant planet, enshrouded in fog and murk. Adventures on the Forbidden Planet and the Mandatory Planet ensue, with the possible cloning of the entire human species at stake! Wednesday June 19, 2013 18h-21h. Online (link TBA), and on air in the neighbourhood. Streaming generously provided by free103point9 Transmission Arts, and the show will be rebroadcast on WGXC 90.7FM NY June 20, midnight-3am. B Radio: a series of radio shows mashing b-list genres with radio art. Each B Radio episode features a theme to structure the improvisational nature of the shows, though tangents are frequent and encouraged. It’s live radio, broadcast and streamed, with special guests and live audience. The core group of performers play live instruments and electronics, sample wildly, speculate broadly, and have been known to sing. NRRF is a collaborative effort to make unlicensed neighbourhood radio art. For this Chicago iteration, the core group of noisemakers consists of Jonny Farrow, Anna Friz, Steve Germana, Jeff Kolar, Peter Speer, with Sarah Knudtson (graphics, documentation and props wrangling). Earlier projects include street radio in Montreal (2001), the NRRF Radio Roadshow (2004), and Radio Free Parkdale in Toronto (2005-2007). 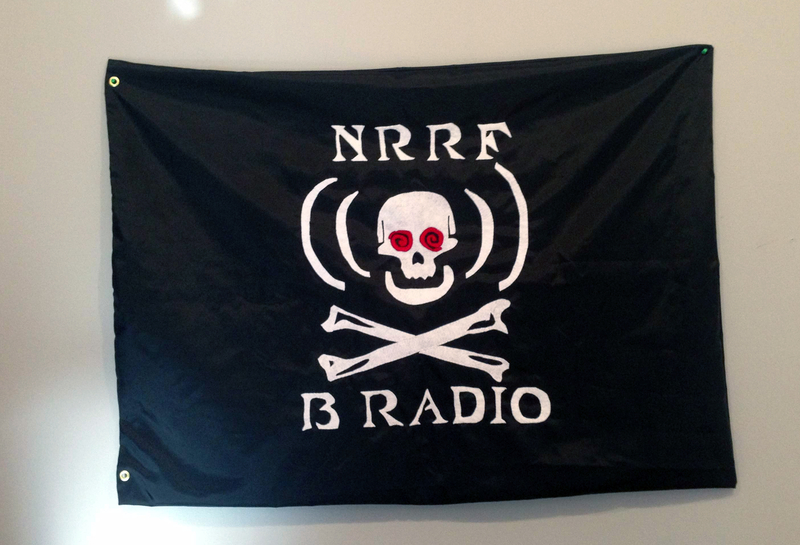 NRRF flag by Jonny Farrow. My little mini-tour of eclectic shows continues… Arrived in Toronto in time to open the 12th annual Deep Wireless Festival of Radio and Transmission Art, New Adventures in Sound Art‘s yearly exploration of all things wireless. Tonight: NRRF presents B Radio: Voyage to the Forbidden Planet! B Radio is an ongoing series of radio shows created by the Chicago-based NRRF crew, mashing b-list genres with radio art. Tonight the NRRF cosmo-noise-nauts venture deep into unknown territories: beyond the Van Allen Belt, demoted planetlettes, beyond the heliopause and far away en route to the Forbidden Planet. This translocal performance features yours truly here in Toronto as Ground Control, with Jonny Farrow, Stephen Germana, Jeff Kolar and Peter Speer in the away pods. NRRF is a collaborative effort to make unlicensed neighbourhood radio. Past incarnations include Radio Free Parkdale in Toronto, NRRF for FTAA in Montreal, and The NRRF Radio Roadshow which traveled from Montreal to New York. The current Chicago-based incarnation consists of Anna Friz, Jonny Farrow, Stephen Germana, Jeff Kolar, and Peter Speer, with occasional guests. Tune in for the live stream here. 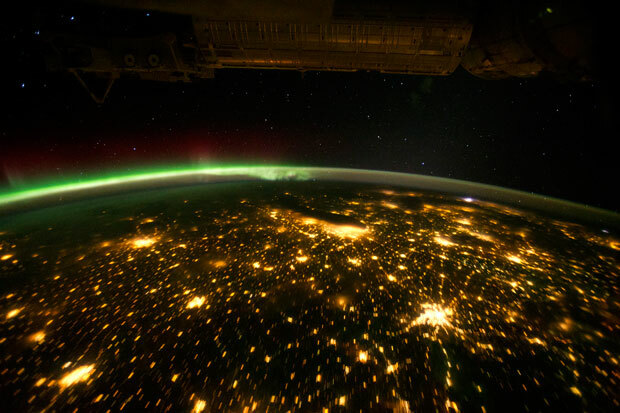 Documentation from the NRRF B Space Station here. Audio archive to follow shortly. If not winter…. then birthday! Who’s Art? Oh, THAT art. “Art’s Birthday” is an annual event first proposed in 1963 by French artist Robert Filliou. One million and fifty years ago today, someone dropped a dry sponge into a bucket of water. And so, art was born. Filliou proposed a public holiday to celebrate the presence of art in our lives. In recent years, the idea has been taken up by a loose network of artists and friends around the world. Each year the Eternal Network evolves to include new partners – working with the ideas of exchange and telecommunications-art. This year it’s the 1,000,050th birthday of art, and I’m getting back into party mode here in Chicago. First off, running a stream together with absolute value of noise of our newly recomposed generative piece Somewhere a voice is calling. We have rethought the piece as a composition and stream, now made with new material, though the concept remains the same: an exploration of the first broadcasts of the human voice into the transmission ecology over radio by Reginald Fessenden and others beginning in 1906. 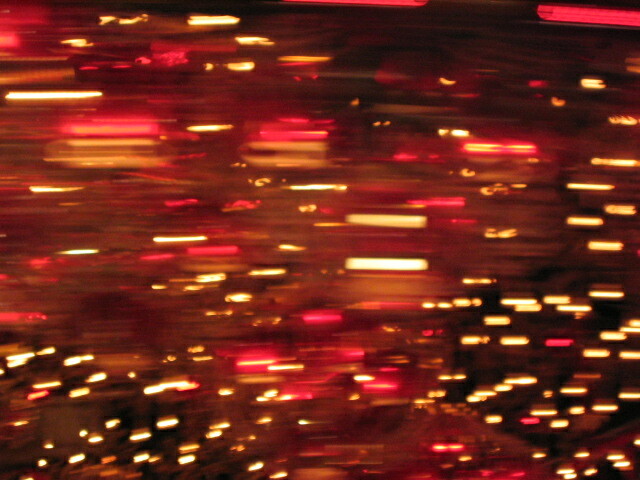 Stream runs January 16-18, 2013, and you can listen in here. Meanwhile, live and fueled by too much sugar, I’ll be hanging out today at the Experimental Sound Studio, which hosts the radio collaboration NRRF Radio in the Audible Gallery from 2pm to 8pm, January 17 (GMT -6). 5925 N. Ravenswood, Chicago. Transmitting to the neighbourhood and the world via FM and stream LISTEN LIVE HERE. We’ll be listening and exchanging with any and all birthday streams circulating internationally, and do our best to infiltrate available bands with tenacious earworms and parasitic refrains, powered of course by lurid birthday cake. Glue Banta, Jonny Farrow, Anna Friz, Stephen Germana, Jeff Kolar, Peter Speer, and guests bring the noise. Drop in, tune in, eat cake. Happy Art’s Birthday! The End is just pretend!